Yesterday's post noted that 2011 was the centennial year of the Olympian, a great Montana passenger train. 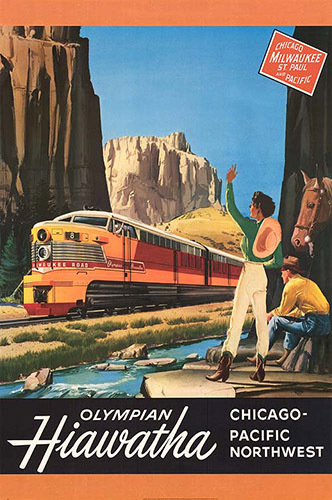 The Olympian traveled the state for 36 years, but in 1947 the Milwaukee Road replaced it with a beautiful new streamliner called the Olympian Hiawatha. The orange-and-maroon train was noted for its modern equipment, created by the famed industrial designer Brooks Stevens. The Hiawatha's sleek "Skytop" observation car was unique among America's long-distance trains. 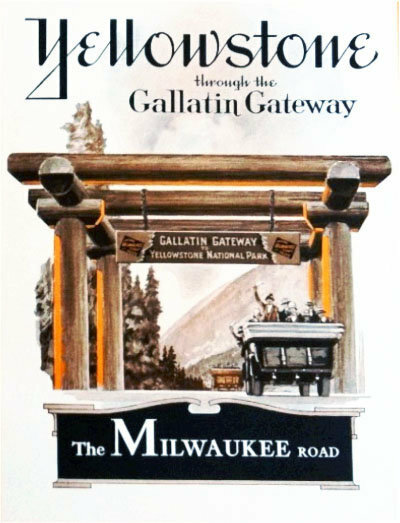 This is one of several advertising posters created by the Milwaukee in the early 1950s to promote the train. 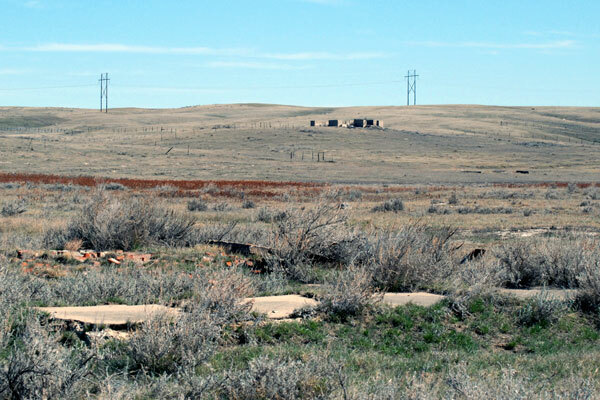 The location of the view is unspecified, but the cowboy hats suggest that the railroad was working to evoke the image of Montana. Sixteen Mile Canyon was one of the scenic highlights of the Milwaukee route, and was frequently a setting for promotional photographs and artwork. Unfortunately, the Olympian Hiawatha's sojourn in Montana was brief. 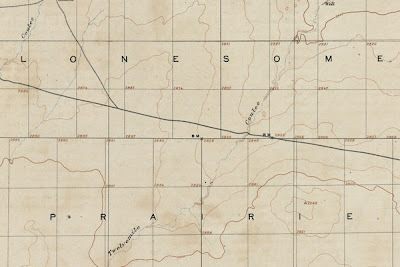 The western segment of the train was discontinued in May 1961, a bit less than fifty years after the first Olympian traveled across the state. 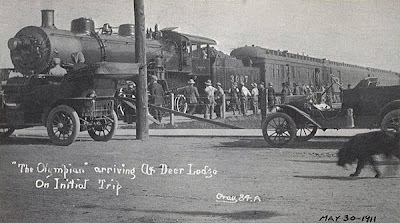 For much of the twentieth century, three of America's great transcontinental railroads traversed Montana east to west, and all three companies served the state with luxurious long-haul passenger trains. The Empire Builder still operates today, the longest-lived and best-known of Montana's trains, but the state's most exotic and memorable passenger trains were operated by the Milwaukee Road. The year 2011 marked the hundredth anniversary of the first of those trains, the Olympian. 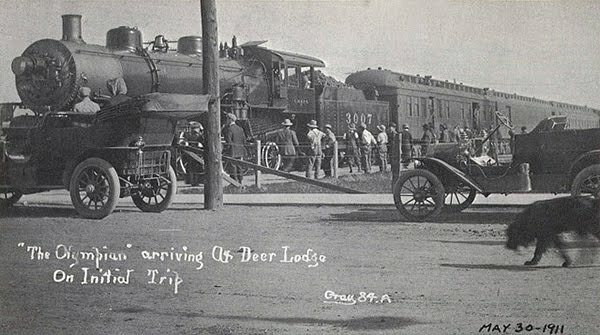 This old postcard view show's the train's inaugural run, pausing at the depot in Deer Lodge. Even one of the town dogs has come down to see what all the excitement was about! The Olympian was a fairly conventional-looking train in 1911, but within a few years the Milwaukee electrified its main line across western Montana. The electric locomotives combined with the railroad's bright-orange paint scheme to give the Olympian a sleek, futuristic style that no other Montana railroad could match. There's no doubt that as a state, Montana is overrun with postcard-worthy views. I've always thought, though, that the very best of those scenes were of Lake McDonald, up in Glacier Park. Most postcard photos of Lake McDonald are shot from the Apgar area, looking down the full length of the lake at the impossibly-beautiful mountains that frame the opposite shore. But I like this closer view even better, taken from the boat dock at what is now Lake McDonald Lodge. 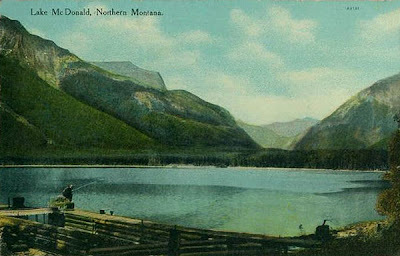 This photo is probably from the first decade of the twentieth century, when visits to the lake were becoming more popular but before Glacier Park itself was formally established ... the caption makes no mention of a national park, but simply says "Lake McDonald, Northern Montana." I spent a winter in Missoula back in my college days, and while I was there I got to participate in an urban-design charette sponsored by the American Institute of Architects. We put together a 100-page report over the course of a single weekend, quite a challenge in the days before personal computers and digital cameras. It was all kinds of fun. The report definitely looks a little ragged by today's standards, thanks to our lack of technology. 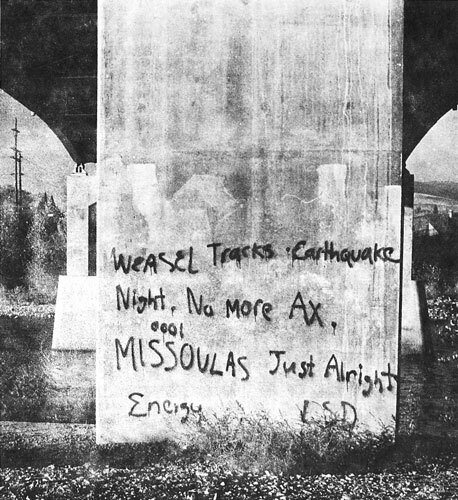 I remember, though, that we were all particularly happy with the photo we chose for the report cover ... we decided that it captured the essence of Missoula as well as anything. I don't know which member of the charette team took the photo, but here it is. It might be the underside of Missoula's old Orange Street Bridge, which was demolished a few years back. Ascendent over the world grows the saffron dawn. The red-naked Indian rides, free-chanting his trail song. 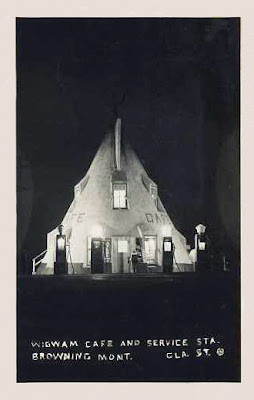 Here's a great old postcard from Browning: the "Wigwam Cafe and Service Station." I won't pass judgement on the political correctness of the design, but architecturally this is about as cool as it gets. The old cafe has of course been closed for decades, but the old teepee-shaped building is still a landmark on the east end of Browning's little main street. Last time I was in town, someone had opened up an espresso stand in the place. There's a similar building down in Busby, too ... that one looking much the worse for wear. Here's a great old photo, probably taken in about 1910 or so. 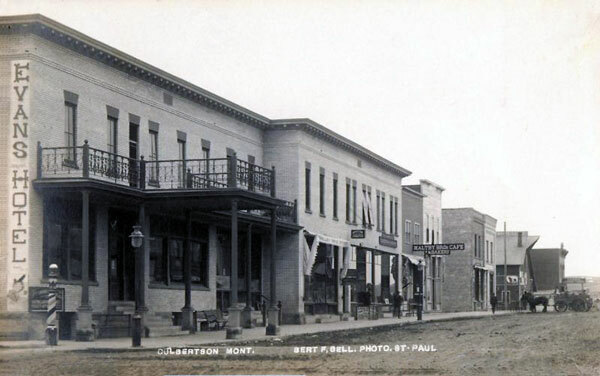 We're in the little northeast Montana town of Culbertson, looking north up Broadway Avenue. The Evans Hotel looks like it was quite the place. The Evans apparently didn't last too long, though. A 1930 map of Culbertson shows a completely different building on the site, called the "New Evans Hotel" ... so probably, there had been a fire. 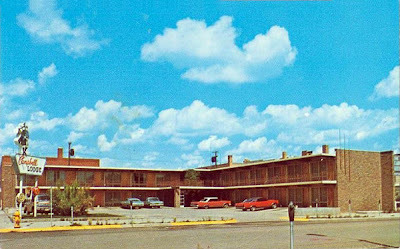 As for the New Evans, the building is still there today, though its no longer a hotel and most of the first floor has long since been boarded up. It would be a great restoration project for someone who wanted to return a bit of style to poor old Culbertson. Going through some old papers at home recently, I came across a page torn from a magazine long ago. The page contained an essay called "Moving Through America," written by a travel author named Caskie Stinnett. The piece described a cross-country trip on Amtrak, including a day spent trundling through northern Montana on the Empire Builder. I'm guessing that the page came from a 1980 issue of The Atlantic, though I don't know for sure. 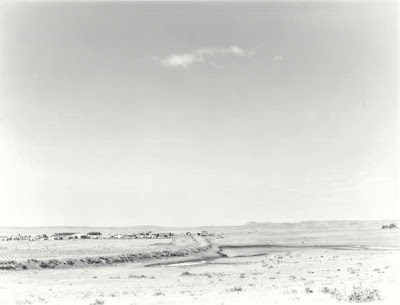 Beyond Wolf Point there was only sky and sagebrush, and I began to realize the tremendous size of this country. As a game, I decided to time the distance between human beings; fourteen minutes elapsed between a boy standing beside a lonely ranchhouse and a man working on an oil derrick in what I assumed was the Williston Basin oilfield. Bars are the thing in Montana towns. On the main street of Glasgow I saw the Stockmen's Bar, the Mountain Bar, Starr's Bar, the Mint Bar, and Johnny's Cafe and Bar. Aside from a dry goods store, there was nothing else on the street. At Havre, Montana, where we stopped for twenty minutes, I dashed out for a bloody mary. The bar was like a stock setting from a western movie, the only incongruous note being a woman bartender. Cowboys, all wearing western hats, sat at the bar, and two young men were playing pool. "I don't know what I've done with the celery salt," the lady bartender said. "Leave it out," I said. "I haven't much time." She looked at me severely. "Don't come in here asking me to cut corners," she told me. When she finished making the drink I asked her to pour it into a paper cup, and I sped back to the train. "You've got one minute to spare," the conductor warned, glancing at his watch. "We're moving right on schedule, and I'd hate to have left you." I freely admit that I have an unusual fondness for kitschy destinations ... and Montana certainly has its share of those. I haven't visited nearly as many of them as I'd like, though. One destination in that category is "Lincoln's 50000 Silver Dollar Bar," in the little town of Haugan, out on I-90 almost to the Idaho line. 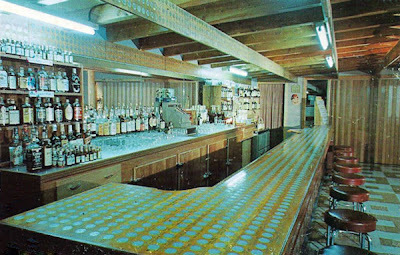 The place started its long run back in 1952, when a single silver dollar was embedded in the top of the bar. Soon, the bar's patrons began a tradition of adding dollars to the display, and before long there were thousands of them, each labeled with the donor's name. The place was called the "10000 Silver Dollar Bar" for a long time, and I've heard that there are now over 70,000 silver dollars embedded in the building today, making even the revised name seriously obsolete. Of course, a whole series of other tourist-related businesses are now attached to the bar, including what purports to be the largest gift shop in Montana. This is an early postcard view of the bar ... probably from about 50 years ago, when there were only a mere 6,000 silver dollars in the whole place. Today's poem is "Montana Pastoral," by a fairly well-known twentieth-century author named J. V. Cunningham. 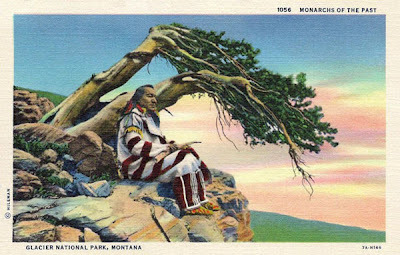 He lived in Montana only for a few years as a child, in Billings during the 1910s and 1920s, but those years influenced a lifetime of writing. 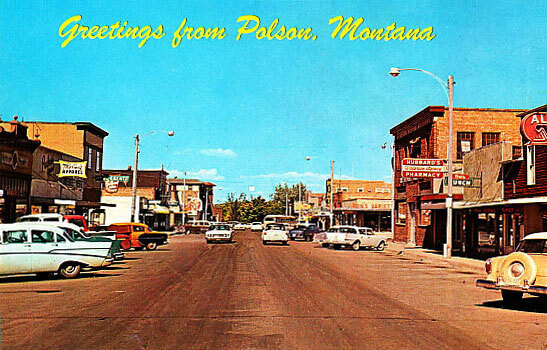 "Montana Pastoral" was written in 1941, and published in an anthology called The Helmsman the following year. And thistle, mustard, and the wild oat stay. Here's a photo I took last fall, showing a slice of small-town Montana life. 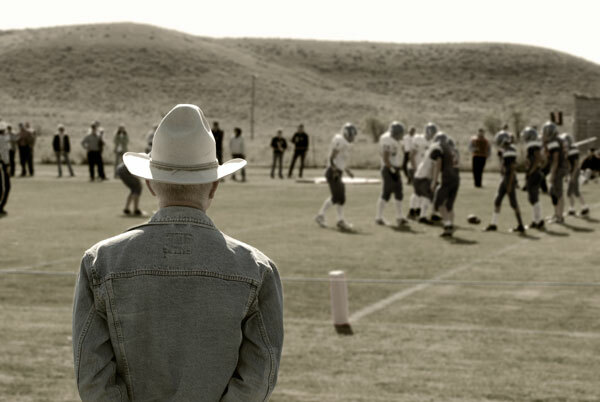 The scene was a football game between the Grass Range/Winnett Rangers and the Highwood Mountaineers. Though the Rangers played very hard, there were only eight of them, half of whom were freshmen ... and so Highwood won in a blowout. Today's photo is an old postcard view of downtown Polson, taken maybe fifty or so years ago. Back then, they probably made postcards like that for pretty much every fair-sized town in the state ... the same head-on view of Main Street, the same script lettering, everything. It's an interesting image, but it's also too bad in way ... there are lots of things that make Polson engaging and unique, but this mass-produced postcard doesn't really show any of them. Here's an evocative reminiscence of life at an old railroad "beanery" in northwestern Montana. It was written by a man named Robert W. Downing, who later rose through the ranks to become president of the Burlington Northern Railroad. Rexford is on the old Great Northern line between Whitefish and Libby via Eureka ... part of which is now under the waters of lake Koocanusa. 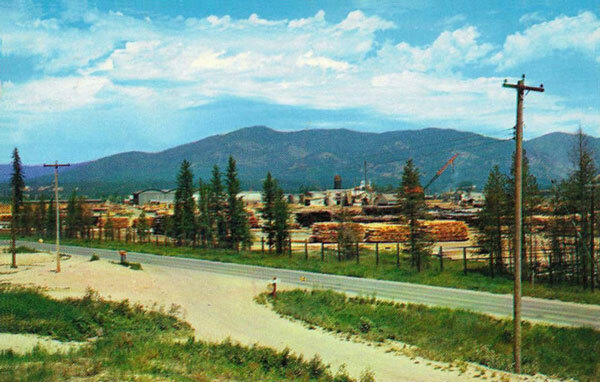 After I became district roadmaster, my assignment was west from Whitefish to Troy… I regularly stayed at Rexford, Montana, which was about the midpoint of the district. There was a railroad “beanery” right on the station platform next to the depot. The lunch room was on the ground floor, and upstairs, there were six or seven rooms for the enginemen on the helper crews that worked up Rexford Hill to Stryker. Also until the Fernie branch into Canada was taken up in 1938, the branch crews sometimes stayed at the “hotel.” In any event, the sleeping rooms on the ground floor were just across a narrow station platform – about 12 feet from the main line, and just about at the level of the stack of a locomotive. When an eastbound freight train stopped there, the through locomotive would be taking water while the helper coupled on behind the caboose. When ready to go there would be a loud exchange of whistle signals, the lead engine would slowly get underway with much it's stack noise. The grade was not too heavy for a short distance east of the depot, so the train would get going very quickly – so that by the time the helper came by your room it would be working wide open and making 20 or 25 mph. The very earth would tremble, and the old beanery would shake so much that the bed would seem to jump up and down. Anybody who could sleep through it was not of this world. Those were the days of real action. Speaking of prairie ghost towns, here's a photo of one of my favorites -- the little hamlet of Ingomar, on the long-abandoned Milwaukee Road mainline across the state. This evocative photo was taken back in the early 1990s by a man named Dave Matthews, who lived in Bozeman back then. It's been many years since I heard from Dave ... he moved back east ages ago, to photograph things that could only be less worthwhile. There are certainly lots of ghost towns here in Montana ... old mining camps up in the mountains, and homestead villages out in the prairies. 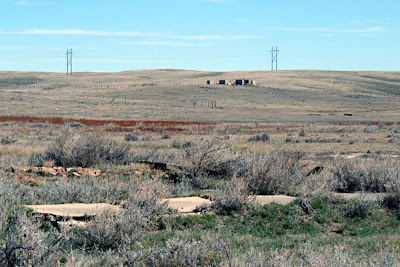 I'm a particular fan of the prairie ghosts, partly because they don't get as much attention, and partly because their settings can be exceptionally evocative. And for me, the old towns don't even need buildings in order to be interesting. 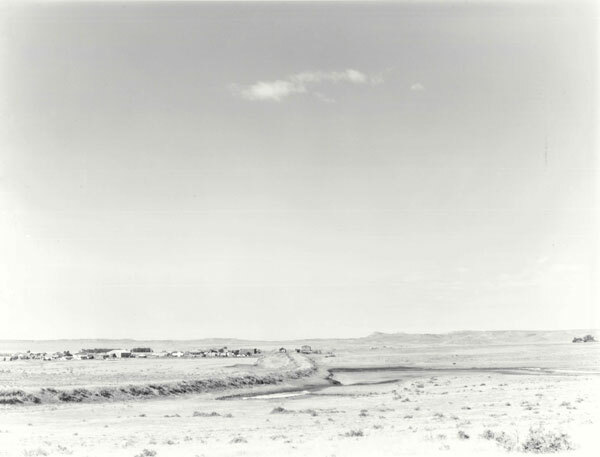 Here's a photo I took when I visited the site of Coburg, Montana a couple of years ago. All that's really left is a few feet of concrete sidewalk, marking the long-vanished site of a building that once housed the general store and post office. And up on the hill, a little ways away, there's an old building foundation ... maybe it was where the schoolhouse used to stand. And that's it. 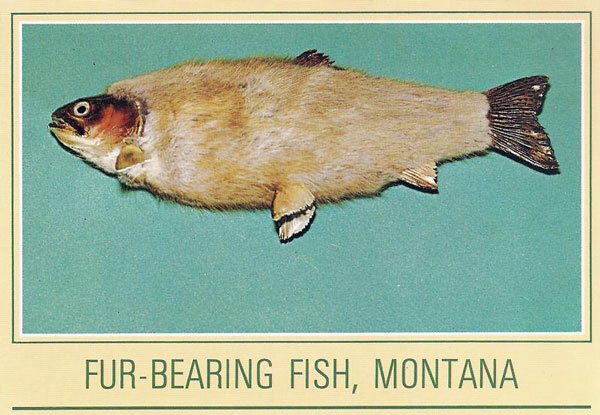 There's no doubt about it: Montana's weather definitely feels like it's been getting weirder lately. This spring, the story has been all about moisture ... lots of snow, and lots of rain. It's a year for flooding. The situation is unsettling enough that it's got people thinking about similar times in Montana's past -- particularly the great flood of June 1964, which hit north-central Montana and the Glacier Park country with amazing force. 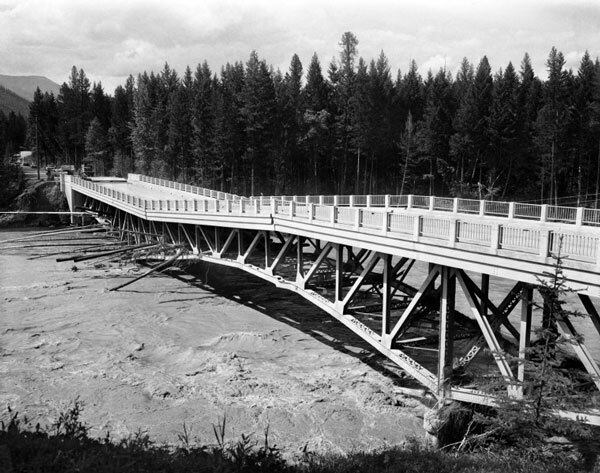 Here's a classic photo from the 1964 flood: the Middle Fork bridge leading to the west entrance of Glacier Park, its trusses broken by the raging water. This photo is one of many flood images captured my Mel Ruder, the legendary owner/editor of the Hungry Horse News. Ruder's reportage of the 1964 floods earned him the first Pulitzer Prize ever awarded to a Montana journalist. Here's another great old postcard photo: "Monarchs of the Past," by T. J. Hileman. 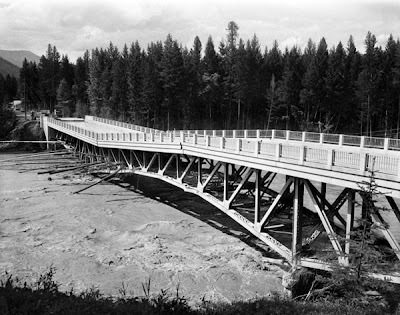 The image probably dates from the 1920s, when Hileman was an official photographer for the Great Northern Railway, capturing views of the Glacier Park country for use in the GN's promotional efforts. The shot is highly reflective of the GN's traditional use of Blackfeet imagery in its advertising materials ... and in a broader sense, it typifies the period's popular romantic nostalgia for the rapidly-vanishing traditions of Native American life. 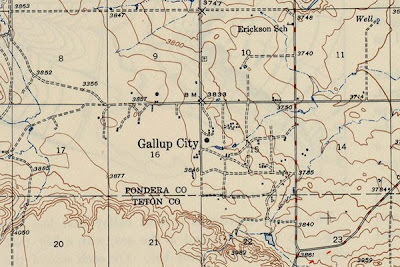 As far as those maps go, I haven't been to either Gallup City or Lonesome Prairie (yet) ... but I have made a couple of visits to Boulder Pass. 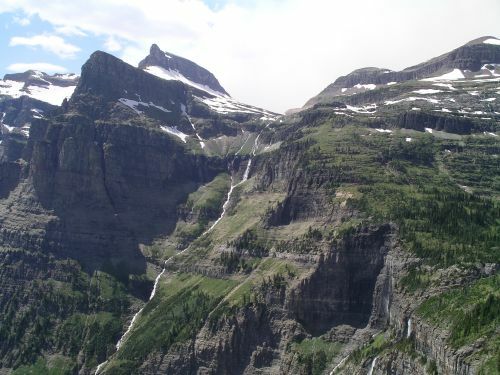 This is a photo from a backpacking trip in 2003, looking across Hole in the Wall Basin. 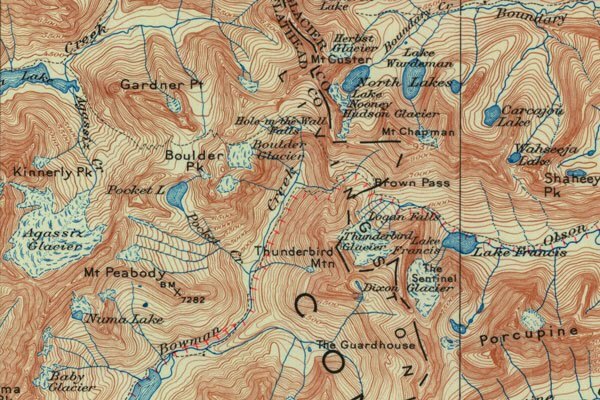 Boulder Pass is in the center of the photo, with Boulder Peak off to the left. 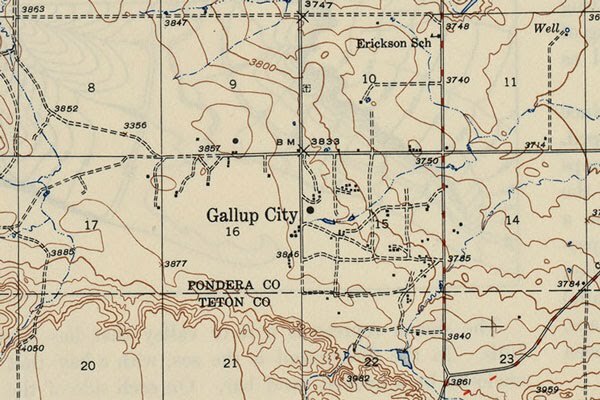 Here's a clipping from another old topographic map, with a place name and a look that's the quintessence of big chunks of eastern Montana. 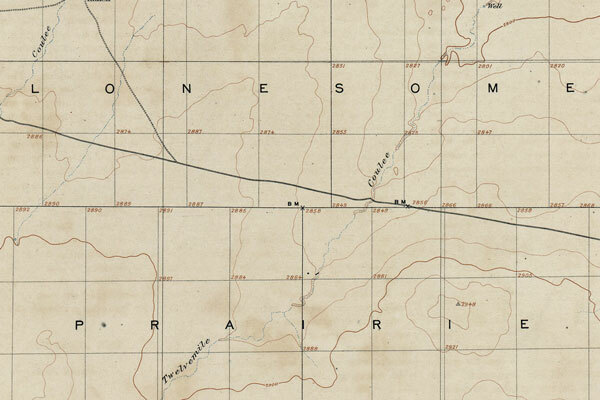 The location is a little northwest of Big Sandy, and the map is from 1906 ... and I bet the country is even more lonesome today. 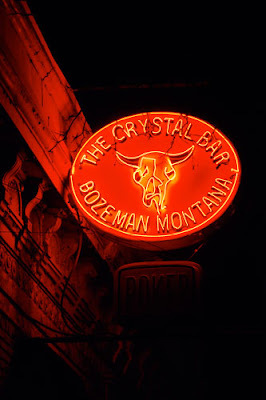 One more neon photo for today ... this is the Crystal, a dark, blue-collar bar that's been on Bozeman's Main Street for decades. I love taking photos of old signs, and I've been doing that in Bozeman for years, now. The neon ones are the best, of course, and Bozeman has a few really great ones ... like this one, up on North 7th. 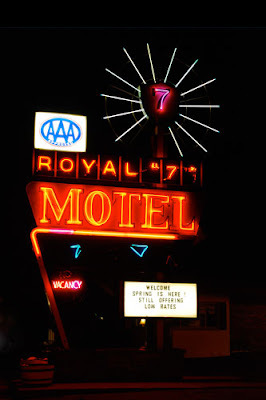 Who wouldn't want to stay at a motel that has a sign lit up like that? I'm sure that if one's starting a business in a town named Glasgow, there can be an almost-irrestible temptation to market the enterprise using a Scottish theme. Hence the Campbell Lodge in Glasgow, Montana ... complete with a huge signboard featuring an improbable kilt.